It's being marketed as a novella, so we're listing it as such, even though our length estimate puts it slightly over. 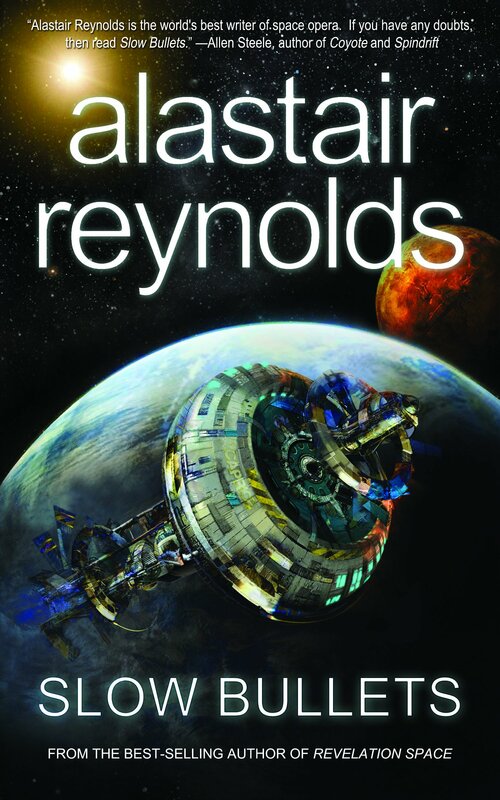 "Slow Bullets," by Alastair Reynolds [bio], published on November 21, 2015 by Tachyon Publications. Pro: Its all about figuring out what's going on and then doing something about it. The story moves fairly steadily from the point Scur is released to the point Orvin is released on the planet. The scenario is interesting, and the action is steady. Con: We have a hard time believing that the Trinity puts up with Scur trying to give orders. I kept expecting them to arrest her and put her back to sleep. Murash's character seems to be wasted. She appears to be there just to give us some info. Likewise her capsule, described in such detail and then forgotten about. The conclusion runs on for way too long. It's as though the author thought about writing a longer work but decided to just summarize it. Also, given the poor condition of the ship, the idea that it managed to visit 100 worlds is really hard to credit. I rate it a 2-3 myself. I got hold of a paper copy and read it. When I first heard of Slow Bullets, I already had 5 novellas that I was satisfied with for the Hugo ballot. The 3-rating that this site gave it was not encouraging, and Amazon.com was even less encouraging.